Nordstrom Anniversary Sale 2017: Sneak Peek and what you need to know! It's the most wonderful time of the year! 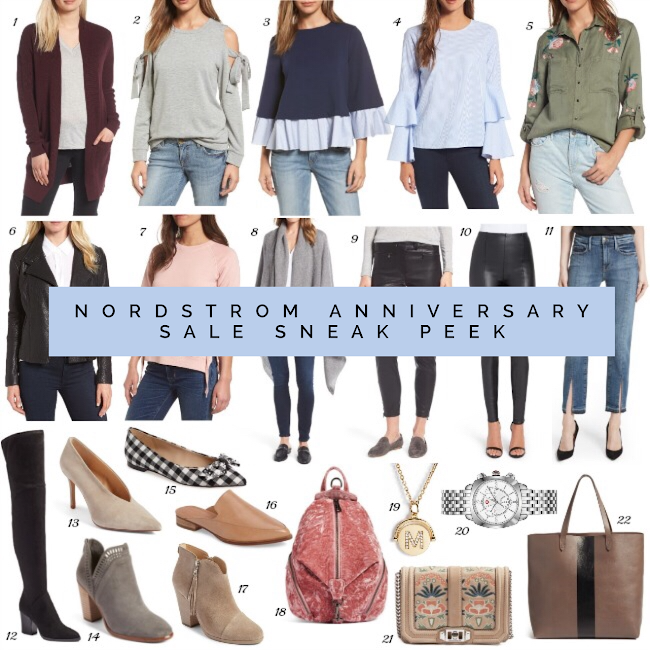 I'm sure that a lot of you have already been hearing the buzz about the Nordstrom Anniversary Sale. There is a reason why it's the most talked about sale of the year, because it's SO GOOD! It's the only sale where you're able to get BRAND NEW fall merchandise at discounted prices. Now, I know summer practically just began, and fall clothing is the last thing on our minds, but I'm telling you, now is the time to stock up! The sale begins this Thursday (July 13th) for cardholders, and here is everything that you need to know. The Nordstrom Anniversary Sale happens once a year, where new fall arrivals are offered at discounted prices. Unlike other sales where the merchandise has been available for a while, this sale is for brand new merchandise. Once the sale ends, the prices go back up. It's also a great sale, because the best brands are included. Tory Burch, Hunter, Rebecca Minkoff, Michele Watches, and Theory just to name a few. Not only is it a great time to stock up on your fall wardrobe, but the sale includes accessories, beauty specials, and home decor. July 13-20: Early Access. This is for anyone with a Nordstrom debit or credit card. It's a great advantage to have the card because you get to shop the sale for a full week before it opens up to the public. I know some items sell out fast, so this way your more likely to snag the stuff you want before your size sells out. You can apply for the card here. July21- August 6: Public Access. This is when the sale is open for everyone to shop. Sometimes sales can be overwhelming, so plan ahead. Take inventory of your fall wardrobe, and make a list of the items that you need. If there is something that you really want from the sale, purchase it right away, as many sizes sell out fast. Last year, I waited to buy, then my sizes sold out in a couple of the items that I wanted, which left me pretty bummed. If you're shopping online, and not sure of your size, I suggest buying two different sizes. Nordstrom has a great return policy, and offers free shipping on returns. That way you have your size before the item sells out. Also, if your size does sell out, keep checking back, as it may be restocked or returned. Below are some of my top picks from the preview catalog. I got to have a sneak peek at all the full list of items included in the sale, and let me just say that you won't be disappointed! These items will be available to shop on Thursday, so I'll have links for you then. I'll also be updating the blog with all of my sale picks once the sale begins, and I'll be shopping it in person on Thursday, so make sure to follow along on my Instagram! 3. Halogen Swing Top. Sale Price $45.90 / After Sale $69. 4. Chelsea28 Bell Sleeve Top. Sale Price $58.90 / After Sale $89. 5. Rails Embroidered Shirt. Sale Price $124.90 / After Sale $188. 6. Halogen Leather Jacket. Sale Price $199.90 / After Sale $299. 7. Sincerely Jules Side-Lace Sweatshirt. Sale Price $79.90 / After Sale $119. 9. Nordstrom Signature Stretch Leather Biker Pants. Sale Price $649.9 / After Sale $999. 11. Frame Split Hem Jeans. Sale Price $179.90 /After Sale $269. 20. Michele Watch. Sale Price $929.90 / After Sale $1395. I am SO excited about the sale and still can't decide what all I need!! These are such great picks! I am loving that blush lace up sweater and the gingham flats! I can't wait for the sale! Counting down the hours!! Thank you for the heads up, I can't wait for it! I'm ready to shop tip I drop! SO ready!! Loving your picks! Cannot wait for the sale. 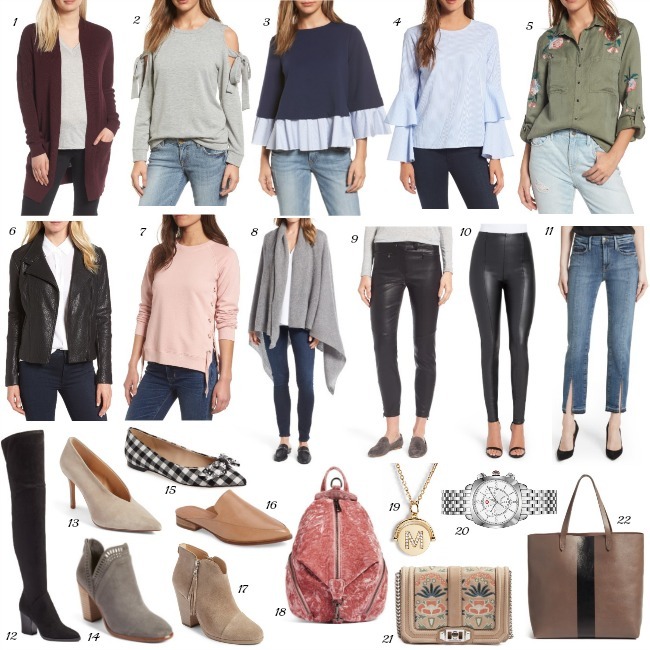 There are so many dreamy items from the Nordstrom sale! Loving the ones you picked! So excited for the sale tomorrow! I need that RM bag! The fourth one is so cute!! Love it! I love this sale and you have got some amazing picks!